Production Description :Keeping track of attendance at office, knowing when your employees come in and leave, and making sure only authorized individuals enter, is extremely important to the security and time management of your organisation. With this Essl Identix K 21 Biometric Time Attendance Machine, available at at a reasonable price, you can easily monitor employees coming in and leaving the premises and also keep a tab on the authorization of the individuals. This bio metric system works on fingerprints. It needs to be plugged in while in use, therefore, does not require batteries. It has a large memory storage capacity and can store a great deal of sensitive data. It has a clear display and the devices measures 183 x 45 x 138 mm. It is black in colour and has a sleek design which will not look bulky regardless of where it is placed. It has a mini speaker and the keypad has soft buttons that will help you punch in your password. The storage capacity of the Essl Identix K 21 Biometric Time Attendance Machine is large and can store up to 500 fingerprint templates. The transaction storage of the device is around 50,000 Logs. The biometric time attendance machine has a 32 Bit high speed embedded processor. It has an identification speed of less than or equal to 1 second, an FAR of less than or equal to 0.0001 per cent and an FRR of less than or equal to 1 per cent. 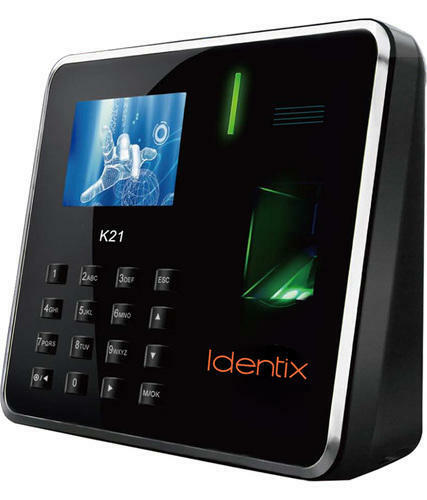 The Identix K 21 has a 500 DPI Optical Sensor which helps in the recognition of the fingerprints stored. The Essl Identix K 21 Biometric Time Attendance Machine has a TFT colour display, which measures 7.11 cm. The device has a red and green LED indicator and a 4 x 4 keypad. It also has a schedule bell and mini speaker that confirms the recognition of the fingerprint. The Indentix K 21 time attendance machine has communication features like TCP/IP, RS232, USB-Host and RS485. The standard features of this security device include an SSR Recorder, DST, Self Service Query, Automatic Switch and T9 Input among others. The Essl Identix K 21 Biometric Time Attendance Machine requires a power supply of DC 5V, 1 Amp. The operating temperature of this device is 0 to 45 Degrees C and the operating humidity ranges from 20 to 80 per cent. It is compatible with software and SDK like Smart office suite desktop and Etime track lite desktop. This helps you keep record of the attendance entries on your system. The Essl Identix K 21 Time Attendance Machine will be extremely useful not just in offices but also to keep track of entries and exits in schools, canteens, clubs, gyms and many more. It will be useful for Production Management as well. It is a wonderful way of tracing time and keeping tab on attendance. We are the self motivated organization, who deals in a variety of CCTV Cameras, LED Search Light, Mobile Signal Booster, Mobile Signal Jammer and house keeping products over the years. we have served our clients with dedication and honesty. We adopt ethical business policies and transparent dealings in our business. Our offered range includes products like Spy Phone Software, Spy camera, CCTV camera, Video door phone, Bio Metric Attendance Machine, X-Ray Baggage Scanner Machine, Currency Counting Machine, Metal Detector, Road Safety Equipment, LED Search Light, Door Frame Metal Detector, Hand Held metal Detector, Alcohol Breath tester, Network Signal booster, Mosquito Killer Machine, Electronic gadget, Underground Search Metal Detector, Mobile Phone Jammer,Walkie-talkie Two way Radio, Currency Counting and many more product are as follow here. Our supplied products are used in homes, private offices, stores, malls,basement,corporate offices, government offices etc. We supply our range of technological products at the most competitive rates. These are widely appreciated for their easy installations, efficient functional life and low maintenance cost. Moreover we also offer these products as per the clients specifications. Under the guidance of our Business Head, Mr. Nishant Gill has lots of knowledge and experiences, who helped us to achieve name in the market.